The World Ski Awards 2018 was a three-day programme of unrivalled networking events, dinners, and exclusive ski experience activities. The highlight event was the red carpet World Ski Awards Gala Ceremony on the evening of November 17th. Ski tourism figureheads and market leaders from North America, Europe, Asia, South America and Australasia attended and the World Ski Awards 2018 winners revealed. A tour of the legendary picturesque town of Kitzbühel - the home of skiing and the home of the World Ski Awards. Your personal guide will introduce you to this enchanting Alpine town's history-rich squares and romantic alleys. Guests to meet in reception at 3:50pm. Enjoy a luxurious sensory experience at the multi award-winning SPA-ROSA. Some much deserved pampering and revitalizing before an action-packed World Ski Awards weekend. World Ski Awards opening networking welcome dinner in an authentic Tyrolean style with dinner in Restaurant Streif – arrive at your leisure! Followed by peer-to-peer networking in a relaxed setting around the A-ROSA bar. Start the day with a vitality breakfast at the Restaurant Streif. Subject to unfavourable weather conditions in Kitzbühel we have devised two plans. 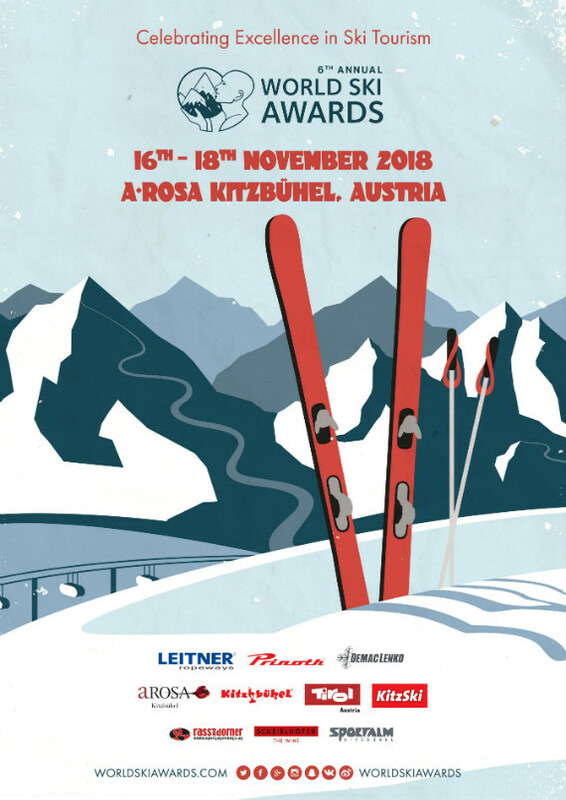 Plan A has been advised for all World Ski Awards guests by the mountain authorities in Kitzbühel due to difficult and potentially hazardous skiing conditions. 09:45 Gathering at the Hahnenkamm-Race start-house, briefing from the President of the Kitzbühel Skiclub, a Schnapps to warm up and Tirolean live music! World Cup team training is currently taking place at the Resterkogel, however conditions are currently challenging for normal skiers, and if temperatures and wind conditions change, the slopes could deteriorate further. The team at Bergbahn AG Kitzbühel are flexible to meet particular requests for skiing on the Resterkogel at short notice. Relax and re-energize in the beautiful 3,000 m² SPA-ROSA. Time to look and feel your best as the red-carpet awaits. The main event that puts Glitz in Kitz! The 2018 World Ski Awards! Beginning with a cocktail reception in the Castle Hall, the glittering evening will include a Gala Dinner, the much anticipated unveiling of the 2018 World Ski Awards winners, entertainment and a celebratory after-party! Shuttle to take you back to Munich or Salzburg International Airports. A-ROSA Kitzbühel is pleased to offer the following special accommodation rates for World Ski Award attendees. To take advantage of these rates, please fill out the following document and return to the reservations team using the email address below.